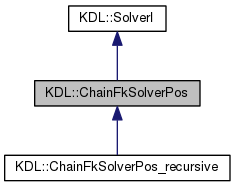 This abstract class encapsulates a solver for the forward position kinematics for a KDL::Chain. Definition at line 41 of file chainfksolver.hpp. Definition at line 65 of file chainfksolver.hpp.